The Tesla Gigafactory is one of the hottest cleantech stories of 2014, if not the hottest. Someone recently passed along a cool Tesla Gigafactory infographic that includes quite a bit of interesting info about the lithium-ion battery gigawatt-scale factory. Of course, it notes that the best way to bring down the price of electric cars is to bring down the price of batteries, and quotes the Tesla estimate that the Gigafactory will reduce battery cost by about 30% per kWh. EV Central. EV Sales. The Tesla Gigafactory is one of the hottest cleantech stories of 2014, if not the hottest. EV2014VÉ Conference Vancouver to be held October 28-30, at the Sheraton Wall Centre, Vancouver, BC Canada. EV2014VÉ Conference Vancouver is the première electric vehicle conference and trade show in Canada with hundreds of delegates, industry experts, and industry guest speakers attending and is organized and promoted by Electric Mobility Canada. There will be static EV and PHEV displays available to view and photograph. 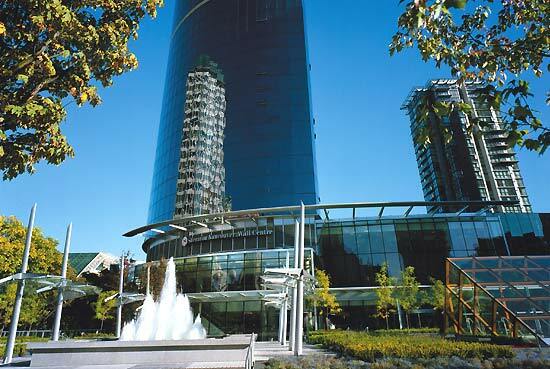 EV2014VÉ Conference Vancouver will take place at the Sheraton Wall Centre Vancouver, October 28-30, Tuesday-Thursday 8:30am-5:30pm. EV Central has been granted an exclusive interview in advance of the event, with Mr. Al Cormier, CAE, President and CEO of Electric Mobility Canada, which is organizing and promoting EV2014VÉ Conference Vancouver. Q1: Thank you again Mr. Cormier for granting EV Central this exclusive interview. How is the EV market performing in Canada and the U.S.? A1: Global trends regarding EV’s and PHEV’s are very encouraging. However, Canada’s sales could be better. 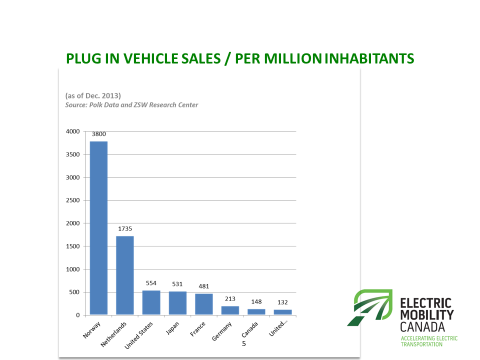 Canadian sales are clearly enhanced in BC, ON, and QC, which are the provinces with financial incentive programs in place for EV buyers. We at Electric Mobility Canada are working hard to get the BC government to renew its clean energy vehicle program that has just ended. Q2: Are hybrid EV’s part of the solution to lower emissions, or do your prefer pure electric vehicles? A2: All forms of electrical transport are welcome. Plain hybrids can reduce emissions by 30%-50% depending on how they are driven — but more importantly, they do not present any ‘range anxiety’ issues for drivers. As EV sales volumes increase, unit costs typically go down and improved battery technology and advanced charging infrastructure is spreading rapidly which will go a long way to reduce so-called EV range anxiety. EV2014. 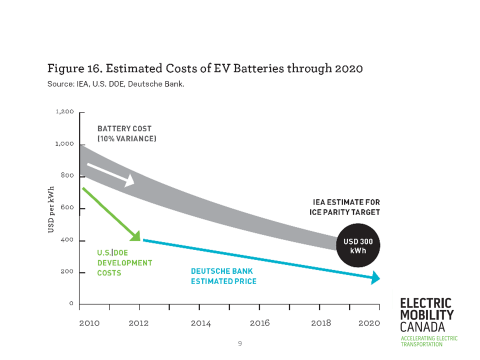 The falling cost of EV batteries will only help EV and Hybrid-EV sales in Canada and the U.S.A.
Q3: Is the future of EV’s going to be made up of ‘free to use’ corporate charging stations such as the TESLA SuperCharger system, or will city or town ‘free to use’ charging stations funded or partially funded by taxpayers be the most predominant form of public charging systems. Or will most EV charging in the future be done at the home or office with a ‘regular’ 120V or 240V (and very slow) charger system? A3: Most charging now and in the future will be done at home or at the office. Public charging stations are mostly free for now, but one can expect changes to that in the future. However, even a $5.00 charge, at say a Tim Horton’s Donuts location, would cost a lot less than an $80.00 fill at a gas station. Q4: Do you feel the switch to EV’s is a ‘far off’ goal, one that may never see the light of day, or be confined to only corporate and government fleets? Or will enough critical mass (media, government and industry) accumulate to generate a paradigm shift in the public mindset to allow EV’s to flourish? A4: EV’s will reach mainstream very soon. Fleets are typically early adopters and most fleets are already in EV’s or Hybrid EV’s — or are looking at them. Plug-in vehicle sales per million inhabitants. Image courtesy Electric Mobility Canada. 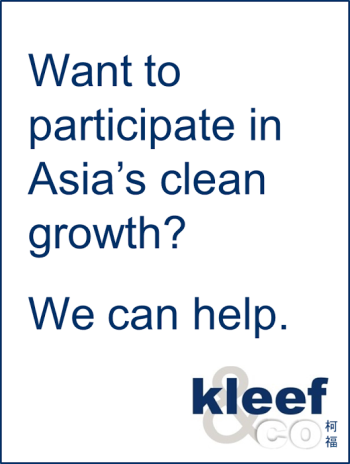 Q5: Are smaller EV companies, such as the VIA Motors V-Trux (GM pickup trucks and light duty vans converted at the factory to EV-only power) and Brammo (100% electric motorcycles) going to be part of this event? A5: The conference program deals with all manufacturers of EV’s, Hybrid cars, and also light trucks such as the VIA Motors ‘V-Trux’, and EV motorcycles such as the ‘Brammo’ electric motorcycle product line. Q6: Is there opportunity to view, sit inside, and photograph EV vehicles that may be on display? Are future (concept cars) going to be on display? A6: Yes, there will be some electric vehicles on display and conference attendees are welcome to photograph the vehicles. There is the possibility an autonomous EV will be on display. Thank you for your time, Mr. Cormier! See Part III of this interview September 1st, which will be published here on EV Central for more information and event updates along with a discussion of charging systems and any grid infrastructure upgrades that may be required to service the thousands of expected EV sales in the coming years.